This meal was both easy and hard to figure out. Easy, because my close friend Deena co-wrote the best Russian cookbook to come out in English in decades, with Bonnie Frumkin Morales, chef of perhaps the best Russian restaurant in the US, Kachka, so I had an expert and a full book of recipes. But also hard, because I didn’t want to just go the easy way, I wanted to force myself to do some research and learn. Alas, it turns out that Deena and Bonnie really did it right, because frankly what I came up with didn’t differ much from theirs; in fact, all I really had to do was remind Deena that we were keeping it homestyle, and maybe something rustic like kasha would be better than elaborate tsarist confections. One thing I really did come to learn is the distinction between Russian and Soviet cuisine. Of course there’s a lot of overlap, but just as it did for many other parts of life, the Communist system made a lot of very intentional changes to the way a whole country ate. There was one core cookbook that was the universal reference book, and state cafeterias generally served from the same array of foods, which interestingly did borrow from some of the non-Russian parts of the USSR, particularly the Caucasus. This meal is kind of a combination; the salat Olivier is a pre-Communism dish that evolved through central planning, the kotlety is pure Soviet but has persisted into present day, and shchi has been a soup of the people for about as long as there have been people making soup in that part of the world. Fermented vegetables, too: Deena shared a quote she gathered from a professor once that if you have Eastern European heritage, you would not exist today if it weren’t for sauerkraut, because that was essentially the only way to get Vitamin C during those long winters. 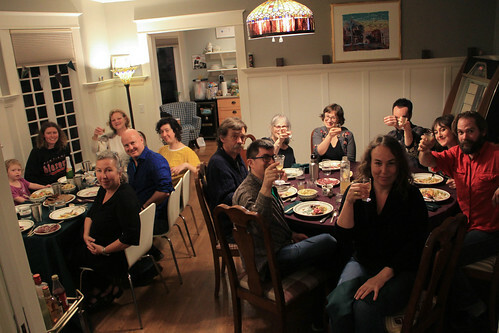 It was a merry crew for this meal: Marisa, Sebastian, Chelsea, Levi, Julie, Marcia, Eileen, Kaz, Susan, Emily, and Sofia. And, of course, Deena, to whom I owe a ton of thanks for all the advice, the trip to the Russian market, and hours of help in the kitchen! 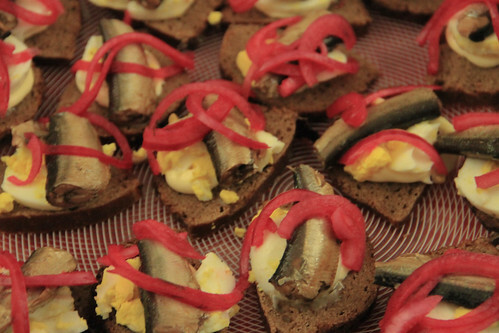 The food at a Russian dinner party starts as soon as you arrive. The table is laden with all sorts of nibbles to get you going. The sprats, mushrooms, and salad below form a part of it, as did sauerkraut and pickled green tomatoes that I made, plus smoked fish and a seriously good kosher salami from the Russian deli. Russians infuse a tremendous variety of things in vodka. Fruits, spices, and herbs are soaked, individually or in combination, for days, weeks, or months, then decanted, shoved in the freezer (or a snowbank), and pulled out whenever a dinner, a visitor, or an illness calls for it. They can be sweet, woodsy, summery, delicate, all sorts of things, but a horseradish vodka is none of these. It’s a punch to your nose, a shock to your mouth, and a bear-hug to your esophagus, all in a matter of seconds, and by the time you’ve recombobulated, you’re ready for some of the strongly flavored nibbles sitting before you. The Kachka recipe—which is so popular it’s sold by the bottle in Oregon state liquor stores—calls for chunks that are gently infused over the course of a week or two. Since I started in on the preparation fewer than 72 hours before the meal, I used the NY Times’ fast-and-furious method, shaving a stub of horseradish to smithereens with a vegetable peeler and making the whole house smell like Passover. Unlike Kachka’s version, which is famously smooth yet still packs plenty of horseradish perk, the quick extraction afforded by all the surface area, plus some peppercorns, made my version a fair bit harsher, even after I mixed in a bit of honey on Deena’s suggestion. But it’s way better to have hurry-up horseradish vodka than none at all! This is the holy grail of sourdough breads to me. It’s got a really complex flavor, a bit sweet from malt and molasses, yet deeply savory from that earthy rye, the tang from long fermentation, and a hint of coriander. Yet it goes with just about everything, from butter and jam to fish and mayonnaise and meaty stews. The process of making this bread wasn’t the easiest. First, I needed a good malt—that is, sprouted and toasted grains. Rye malt, not surprisingly, is preferred, but nearly impossible to find; but Annie, our friend who runs a bakery, just so happened to have made her own malt (!!) a few days prior and generously lent me some. You really oughtn’t make this without malt, as you need the enzymes to properly develop the sugars that the sourdough feeds on. Speaking of, Annie also gave me a rye sourdough, which saved me the hassle of transitioning over my wheat starter over the course of a few days. The next tricky part was that it didn’t rise nearly as quickly as the recipe suggested it would, even with some coaxing in the oven with the warming drawer on, so by the time I was supposed to have finished the bake, the loaves still had some time to go in rising. I had to go to a show, so I put them in the basement to slow down the fermentation, then stuck them in the oven when I got home. It finished at around 12:30 AM, but the proof was in the nibbling: this is a damn good recipe. One hint: go easy on the wheat wash, especially if you plan to keep it on hand for a week or more. Rye bread famously keeps a long time because of the sourdough, but plain flour doesn’t have that benefit, and the top of the bread got moldy while the rest could have lasted a long while. Also, if you’re going through all this effort, at least double the recipe—the ingredient cost is way lower than your time investment! Mushrooms, particularly ones foraged in the forest, are a prominent part of home cuisine in Russia. One way to make the most of a good haul is to preserve them, whether by salt curing, or in a liquid marinade as done here. I’d say technique-wise this turned out pretty well, even with boring store-bought brown mushrooms, though I found this particular recipe to be too heavy on the cloves. Butterbrot is a German word, meaning simply “butter bread,” but in the Russian case the borrowed name seems to refer to something assembled, a sort of sandwich. This version—which, ironically, is built on top of mayo, not butter—is Kachka’s calling card, a nibble so integral to the restaurant that it’s what they offered as a sample recipe for a news article. It reminds me so much of what my grandparents liked to eat: fish, rye (we toasted little slices of the bread I made), boiled egg, and sharp greens. If this sounds good to you, you’ll like it. If it doesn’t, you won’t. 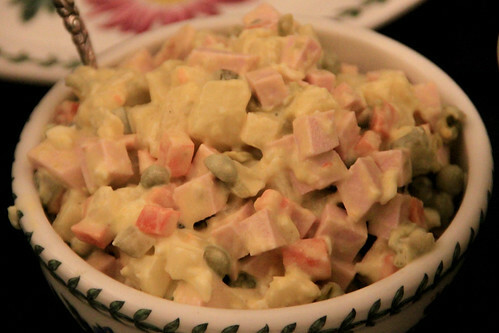 This salad is so endemic to the cuisine that many places around the world call a mayonnaisey mess of potatoes, meat, and vegetables a “Russian salad” in their language. But, as with so many foods, the origin of this food comes not from a Russian, but rather a French chef who composed something quite a bit fancier involving game birds and shellfish at a posh restaurant in Tsarist times. The recipe got thoroughly Sovietized, with ingredients much more in the commoner’s reach such as boiled eggs and bologna (for a tangent, here’s a fascinating history of how Soviet bologna is derived from the American version! 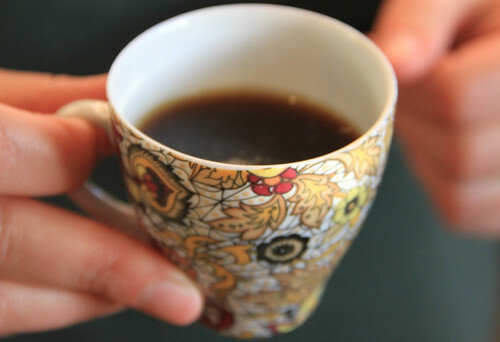 ), and it’s now de rigueur at any social event and particularly a New Year’s party. I though this was not amazing. At first it was quite dull, so lent it a bit more flavor by throwing in a bit of pickle juice, which rescued it somewhat. I’m not sure whether it was my own shortcoming, or if this is just as intended. But the mouthfeel is amazing, and I could definitely see hoovering a ton of this while drunk and hungry. Apparently, in Siberia, they traditionally make these dumplings by the hundreds and just keep them in outside in the harsh winter, pulling out and boiling from frozen whatever they need for dinner. (In my mind, they throw them straight out the kitchen window into a snowbank, but they’re probably tidier about it than that.) 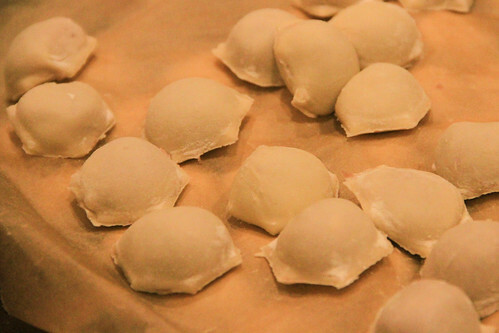 But as so often happens, what’s borne of necessity proves useful even in more resource-filled times: once assembled, these dumplings just don’t keep, you either gotta boil them right away or put in the freezer until cooking, even if that’s just for a half hour. We would not have eaten this dish if not for Deena. First of all, she co-authored the recipe (which was “adapted” on the linked page). Secondly, she brought the pelmenitsa, the purpose-made honeycomb mold that makes exactly 37 at a time, no fold-and-pinch required. And thirdly, she rolled out the dough, which I just hate doing. So thank you, Deena, for being you, for being a friend, and for having good arm strength and patience to roll dough. The most important part of this recipe, though, is the dressing at the end, with butter and that little bit of vinegar. It’s really what makes the whole concoction sing. And disappear. We made about two hundred of these things and they almost all disappeared, despite all the other stuff we served. Every recipe I found for this Platonic ideal of a peasant soup quoted the same saying: Shchi da kasha – pishcha nasha, “Shchi and kasha are our food.” (That phrase has fantastic prosody!) Though as the Kachka cookbook explains, there’s not really such a thing as recipe for shchi, but rather you compose it from (usually) cabbage, plus whatever meats and veggies you have on hand. So while this one page I link to calls for chicken, and Kachka suggests spare ribs, I used what I had on hand: part of an unreasonable amount of ham that was gifted to me at a Halloween party, and some thin shaved brisket in the freezer that I’d erroneously purchased for the Korea meal back in February. I’d like to think that the haphazard provenance of the material, more than its identity, made this soup a shchi. Similarly, though more intentionally, I made a quart of sauerkraut using cabbage that I planted in the spring specifically anticipating the Russia meal. I started this soup at 11 the night before, when I had to throw the bread in the oven. That was long enough to simmer the meats for about an hour and a half; I quickly cooled them in a hotel pan (big surface area = faster cooling), fridged overnight, skimmed fat in the morning, and cooked for another hour until the meat was crumbling. 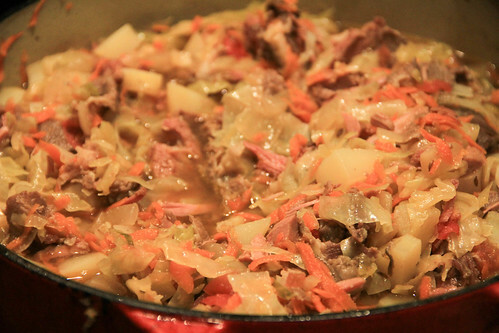 I extracted the meat, cut it finer, and built back up a soup using the sauerkraut plus veggies sauteed on the side. Another simmer, then hotel-pan cooled again and back in the fridge to develop flavor, and finally reheated before dinner. 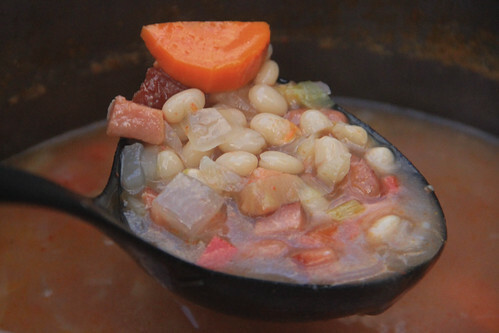 Especially with a dollop of smetana, this was one frickin’ tasty soup: just enough salt from the ham, a good beefiness from the brisket, and a surprising amount of flavor from the veggies. This particular shchi will never be repeated, yet at the same time it’s recreated a million times a day. That’s the beauty of shchi. The same guy who brought bologna to Russia is also responsible for this dish. Despite the name, it’s not a schnitzel-type pounded meat cutlet, but rather it’s essentially a pan-fried torpedo-shaped meatball. 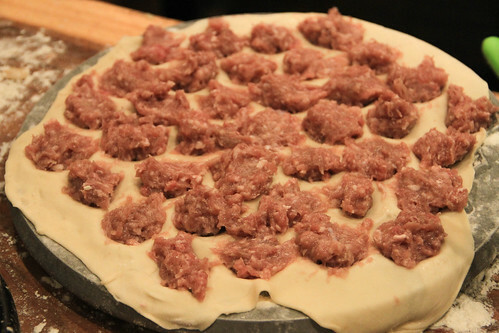 Whatever you call it, it’s an extremely common dish, made of just about any kind of ground meat with grated onions (beware, eyes and knuckles!) and breadcrumbs or milk/water-soaked stale bread. Don’t be fooled by the simple list of ingredients, these are really quite tasty, with the crisp from pan-frying making them a fun texture too. So long as you don’t overcook them, the meat holds plenty of moisture. Remember that proverb above? Here’s the second half. 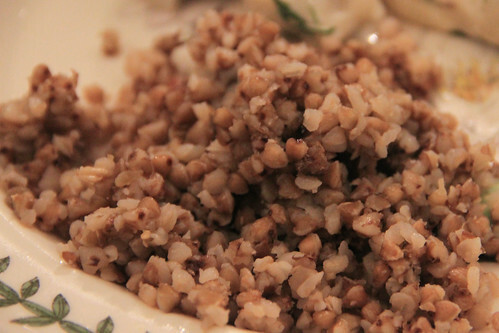 While “kasha” in English tends to refer specifically to buckwheat, in Russian it simply refers to any simmered grain, but whatever, here we are with some toasted buckwheat, cooked in water then tossed with a generous amount of butter. 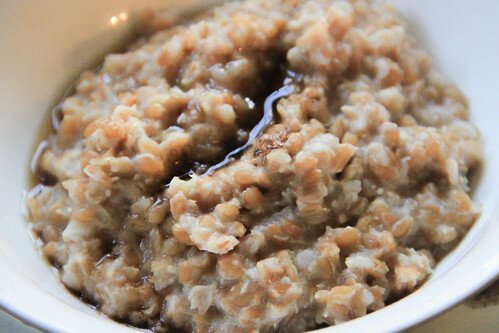 I like the nuttiness and toothy texture of buckwheat, so this was a pleasant accompaniment to the kotlety. If you thought pancakes were already a perfect food, did you ever think about taking out most of the wheat and replacing it with cheese? Yup, Russian farmers cheese is dry and soft enough that it mixes up into a really tasty dessert. I also whipped up a basic compote of frozen raspberries with a bit of sugar and lemon, just because. 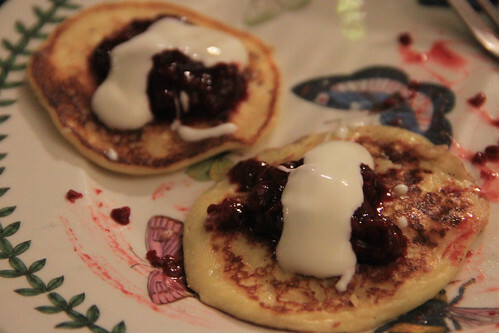 It did take forever to cook small pancakes for 16 people—thank you, Deena, for all that time spent over the stove!—but it did all get eaten, so it was clearly worth it. 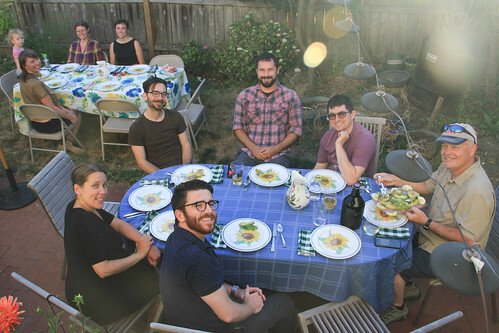 Following in the footsteps of Namibia and Panama, this was our third annual Neighbor Nosh! We got a permit to shut down the block, and set up tables and chairs right in the middle of the street. 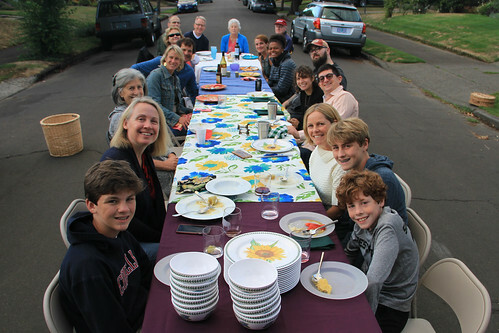 It was so neat to take the neutral space we all use and see every day, and to claim it as a not just a gathering place as with a typical block party, but for sharing a sit-down meal to spend quality time with each other. I encourage anyone to do it even if they’re not forcing a random country’s food upon their neighbors. We all agreed that this was the best of the three such meals. Romanian food has a lot of flavor and variety, ranging from sensations like tangy, spicy, and garlicky, to rich, hearty, and comforting, an imprecise contrast which roughly parallels the heavily overlapping Ottoman and Slavic influences. 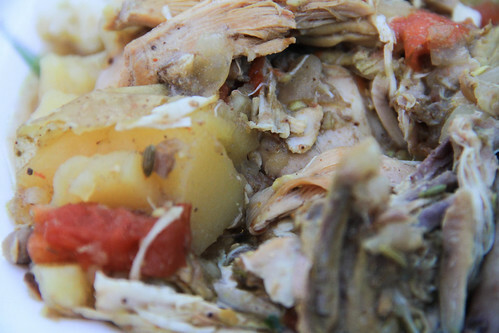 Adventurous foodies and picky kids alike found plenty in this meal to enjoy! On the side, as accompaniment to everything, we had smântână (the sour cream common to Russia and other Slavic cuisines) and mujdei, which takes many forms but here was a bunch of garlic mashed with salt and a bit of sunflower oil, as pungent as it is simple. 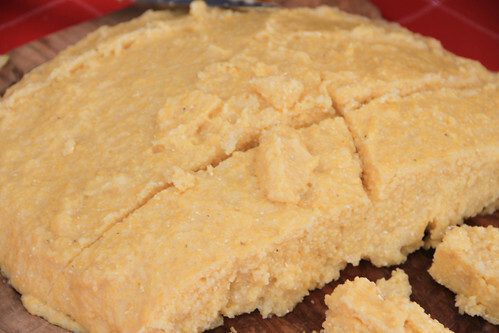 Just like polenta, it’s made out of coarse cornmeal and water. 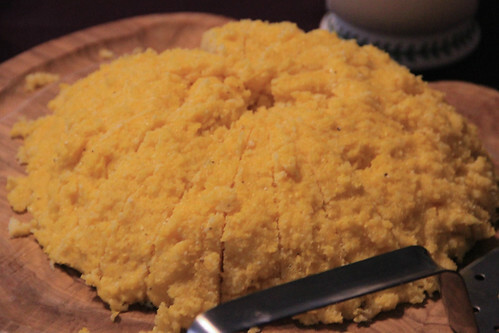 But if you call Romania’s staple starch polenta, this blogger will not be happy. 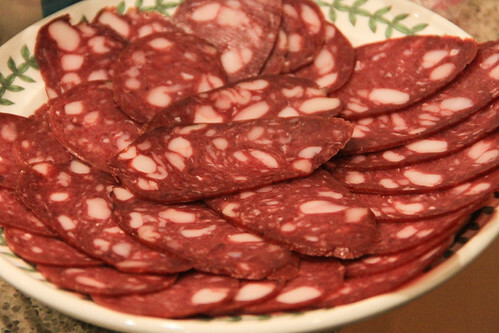 They have a point: basic mămăligă is even simpler than polenta, without the salt and butter and/or cheese that Italians use (though there is a more done-up version like that), and is also cooked to a thicker state. 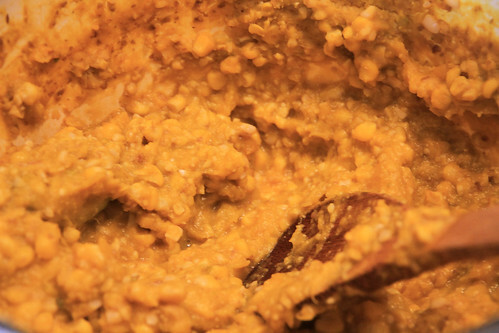 In fact, it’s simply poured onto a board where, thanks to the lack of fat, within a minute it magically congeals into a mass solid enough to slice and hence a fine vehicle for dips or even dipping in soup. Despite being called a salad, this is really more of a dip or spread. 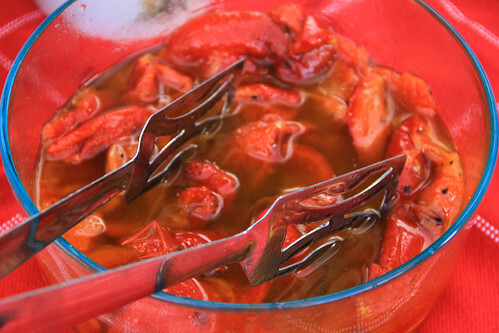 It’s super simple, just roasted peppers with a lot of oil and some lemon juice. 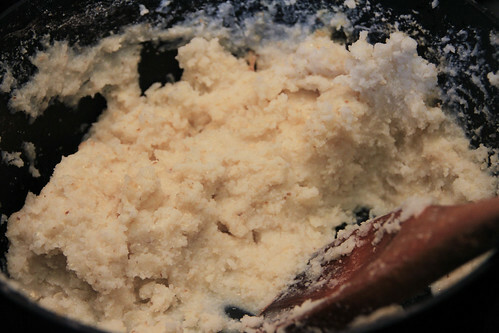 I made it two ways, in the food processor and mashed by hand. The first was, as expected, a lot smoother and fluffier, while the hand-mixed version was heavier and more textured. I rather preferred the first, especially because it took a lot less work. Despite also being called a salad, this is really more of a marinade. It started with a fire sale on red peppers a few months prior, which I threw on the grill that day, peeled, and froze in their charred state. Then I just defrosted them, mixed them in the dressing, and that’s that. Oily and tangy, they’d be great on a crusty bread, but were also just fine with what we had. Simmer fruit in water with a bit of sugar, then cool it down. Is it a drink or a snack? Yes! Depending on what fruit you use, this can either be tasty — the cherry version went in an instant — or weird, as evidenced by close to a gallon of leftover grape compot that looked like a vessel of hundreds of alien eyes. 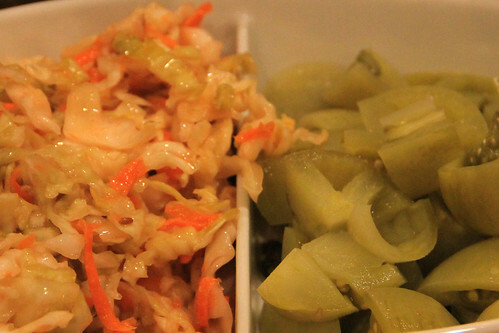 From everything I’ve read, pickles are a huge deal in Romania. There are a million different things you can pickle and ways to pickle (I even read about vegetables stuffed with pickles before pickling), but this is perhaps the most basic: put a bunch of veggies in a jar, fill with salty water a few spices, and wait. Classic lacto-ferment, and tasty. The fun part of this one was that thanks to red cabbage, it all turned pink while the cabbage itself lost all color. 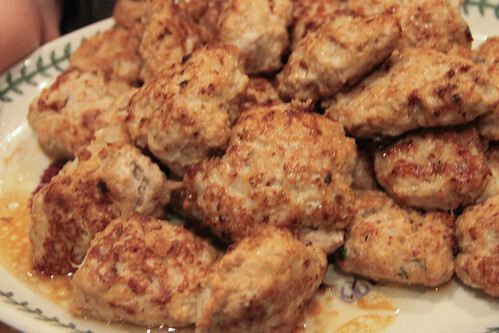 The two most common Romanian soup recipes online are with meatballs or tripe. The former is just too similar to the filling of cabbage rolls (see below), while the latter just didn’t strike me as the best thing to foist upon two dozen unsuspecting neighbors. While a bean soup is perhaps more classically Moldavian than broadly Romanian, it did seem a good choice to balance things out. Plus it was a chance to try my hand at borş, which is the same word as that Ukrainian beet soup, yet in Romania it refers to a sour fermented liquid made from wheat bran. I made two parallel pots, one soured with borş and the other with sauerkraut juice. The one with borş was a little more mellow, but they both were quite good, especially with the smoked pork adding richness. And, as with almost all soups, it was even better the next day. But this ended up tasting really good! And I learned a new cooking technique: lining a pan with salt to keep the fish raised a bit off the pan, so you can get it good and hot but not have to fry it. It might have gone even better if I could have found my coarse salt, but a healthy layer of kosher salt worked ok. Once thus cooked, the fish is baked with a “marinade” of vinegar, veggies, and chilies, and the result is delicious: the fish is firmer than it’d have been if simply poached, and the zesty sauce was a real tongue-tickler. 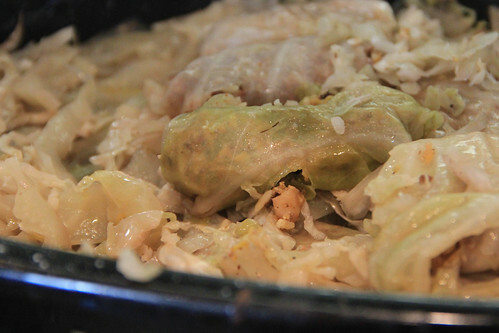 After allll that, we get to the sine qua non of Romanian food, the cabbage roll. As with so many treasured national dishes, there are as many variations as there are grandmothers. I pretty much followed the linked recipe, except that I didn’t use as much pork belly as she called for (I found it incredibly hard to chop up, on reflection I should have frozen it a bit), and instead used more ground pork. But I was generous with the smoked meat and bacon, exactly as specified. I managed to make one head’s worth of whole cabbage leaf sauerkraut about ten days in advance, though I couldn’t fit a whole head in the jar so instead I separated the leaves which I then fermented. Fearing that one head wouldn’t be enough, I also used a fresh cabbage, which I softened and separated using a novel technique as described in the recipe: boil the whole head, carefully removing a few leaves with tongs every few minutes until you get to the core. These were really delicious. I loved what the savory and the dill seed did, just different enough to make it feel like I was eating something distinctive. 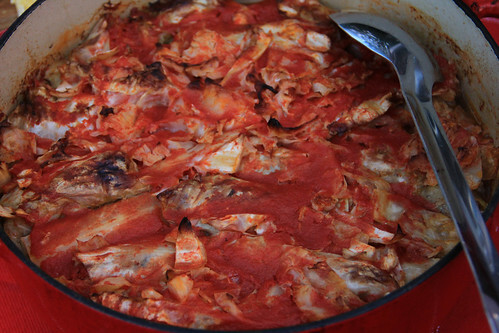 And the rich meat, with the tangy cabbage, and just enough tomato sauce...really, a great and satisfying combo. Frankly we couldn’t tell much of a difference between fresh and sauerkraut leaves, because I put sauerkraut juice in the fresh leaves’ pot so it all kinda tasted similar. Given everything else I made, there were, conservatively, 80 rolls left over. So make these, but if you make a lot, have some containers on hand to send home with guests, or bags to toss ‘em in the freezer. As discussed in the Moldova post, the Romanian name indeed is the same our word “placenta.” Thankfully, this version was a lot better than the one we did for that meal. Instead of a turnover, this recipe is essentially two separately baked cakes sandwiching a filling, and it turned out with more flavor and a better texture. A big thank you to Marisa down the block who made this treat! 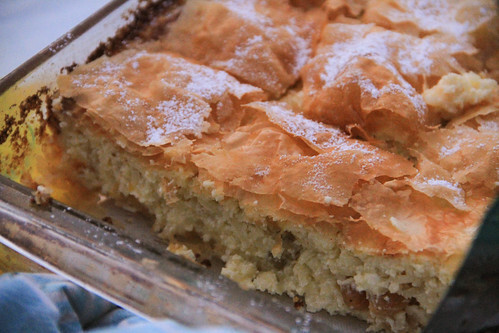 This dish is considered Hungarian, yet it’s commonly eaten in Transylvania in Romania’s north, so it counts. 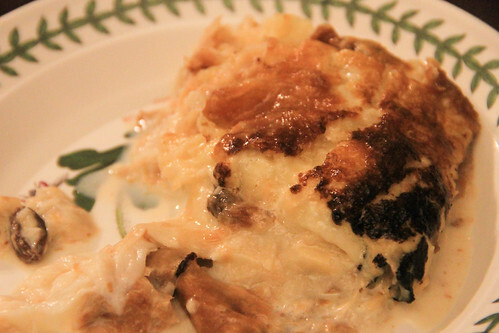 It really reminds me of the classic Ashkenazi Jewish dish named kugel, the major difference being that this one has layers of filo dough to give some extra crisp, while the addition of a little lemon and egg white make it more firmly dessert-like. Our neighbor Betsy did a beautiful job, but also baked way too much, which I didn’t mind because this made for a great breakfast the next few days. Did you know a country just changed its name? The king of what had hitherto been Swaziland, Mswati III, declared two in April that, in honor of 50 years of independence, it's now the Kingdom of eSwatini. (Apparently the change was in part motivated by confusion with Switzerland, while some accuse the king of distracting people from his profligate lifestyle with his 16 wives, as well as a sky-high AIDS infection rate.) While the adjustment is a victory for defenders of camel case, the news was a bit inconvenient for those of us who are partway through a rambling effort to cook a meal from every country in alphabetical order. Since we'd already long passed the E's, and it will no longer be there when we get to S, according to our unwritten bylaws, we had to cook it next. 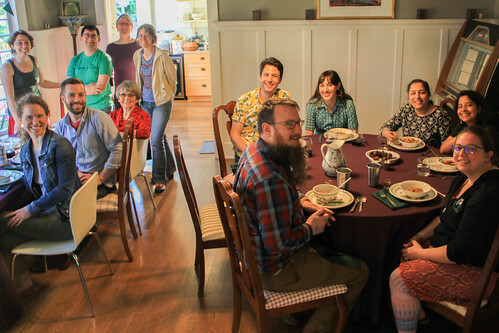 It was my birthday meal, so I invited my favorite people in Portland. Around the table were Quinn, Laura, Drew, Craig, Haley, Emily (and Sofia! ), Taylor, Chelsea, and Deena. 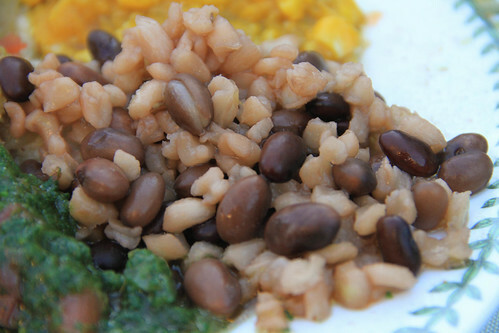 This is one dense dish, and it’s quite tasty and healthy too. The sweet fresh corn goes really nicely with the pumpkin, and it’s a complex texture with the pumpkin being smooth, the corn being just a bit toothsome, and the peanuts adding a rich, oily mouthfeel. I could see this being an excellent food for kids. I saw discussion of meat stew being a food for festive times, but couldn’t find a single recipe. So I found this one from adjacent Zululand in South Africa. It’s possible these flavors are more complex than you’d find in eSwatini, as I just have no idea if curry powder made it that far. But all the same, it was a good and tasty dish, a nice balance of meat and veggies. I’m pretty sure the siSwati word sitambu comes from the Afrikaans stamp, which means the same thing as in English. (But in English, the same food is confusingly known by a very similar word, samp, which itself comes from a Native American word.) In any event, it’s made from dried, whole-kernel corn that’s crushed (or, you know, stamped) into a few pieces per kernel. You cook it just as you would beans—soak overnight and slow simmer. So it’s no wonder that they’re often cooked together. And as it so happens, they taste good together. It’s redundant to have this along with the sitambu, but I felt I had to get the full trifecta of corn in here. As with so many African countries’ food, it’s the most common dish, simply mixed with water until it’s thick enough to be made into a ball. Moldova, as far as I can gather, is essentially the part of Romania that became part of the Russian Empire about two hundred years ago, and then the USSR about a century after that. The socioeconomic legacy of that border is stark: Romania's economy was deemed strong enough to join the EU in 2007, while Moldova remains the poorest country in Europe. However, linguistically and, crucially to us, culinarily, they're extremely similar. Anyway. Romania is right after Republic of Moldova in the alphabet, the foods are similar, and thanks to its Ottoman Empire legacy, a lot of it is in that eggplant-pepper-tomato-bean spectrum. So we decided to make this meal fully vegetarian, and the next one all about the meats. 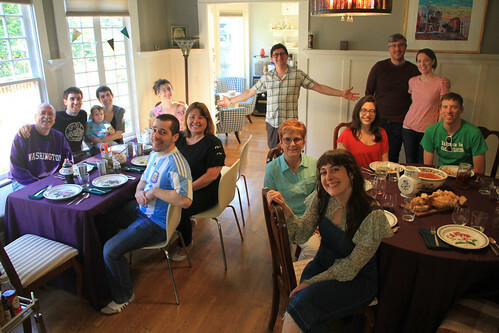 Around the table were Nancy, Eric, Zef, Desi, Annette, Chelsea, Dee Dee, and three generations of Abraldes family: Grace, Robert, Michael, Tim, Christine, and little Celeste. 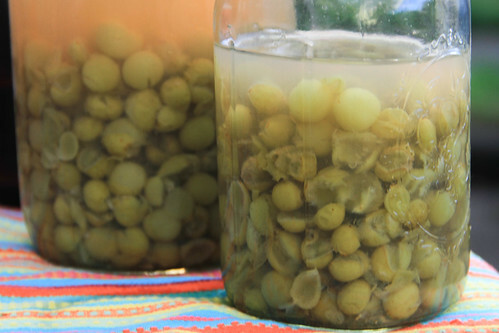 When I noticed that Moldova's got a fierce pickling game too late to ferment my own, I explored what could be done the faster way with vinegar, and found grapes mentioned a few places. Wine has been made in this region for thousands of years, and In fact, I read that Moldova's wine-based brandies were favored by the Soviet elite. So I pickled grapes! This was the very definition of sweet and sour, with a cup each of vinegar and sugar, along with mustard, peppercorn, and cinnamon. Having sat for only two days, the flavor was certainly a bit brash, but the grapes preserved nearly all their pop, and it was a great snack. 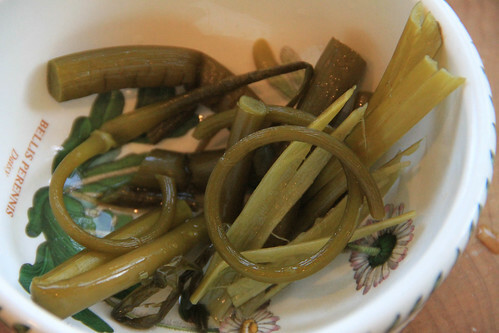 Since it's mid-June, it's scape season, and I noticed the quick-pickled garlic scapes when flipping through the Kachka cookbook. The recipe isn't specific to Moldova or Romania, but I figure I was in line with the spirit if not the letter of the national proclivity toward vegetable souring. I harvested all my garlic scapes plus the enormous (we're talking two-plus feet!) leek scapes, simmering the latter a few minutes before adding the former because they're thicker and needed the extra heat to break down. Their relatively mild pungency and toothy texture stand up to the vinegar brine, making this really the perfect way to highlight this fleeting and lovely gift of the garden. Zakuska in Russian refers to an appetizers or snack typically eaten with booze. 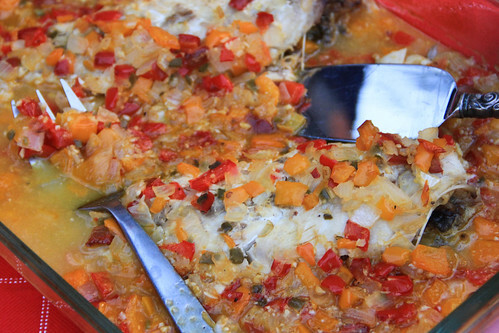 In Romanian, the term has come to be applied to one specific dish, of roasted peppers and eggplants simmered for hours with other vegetables like onions and tomatoes until it's rich and spreadable. Zacusca is typically made at the peak and end of summer to preserve the bounty, and canned for year-round enjoyment. I went a bit overboard and cooked it over a slow fire in the grill, figuring that since the eggplant ought to be fire-roasted, why not just keep the flame going gently. It was a novel way to cook, but unfortunately the hours of smoke didn't really seem to impart much flavor on the dish, so I just should have done it on the stovetop and saved myself a few blasts of smoke to the eyes. Anyway, it's tasty enough, and I'm sure it'd be a welcome jolt of flavor and vitamins in the middle of a long winter, but I didn't find it particularly exciting. Plenty of places mash up beans, but this method has the genius to add a lot of onion sauteed in a lot of oil and some tomato: half blended up (along with a lot of garlic) to make the mash proper, and the other half making a pretty topping. Very nice spread on bread, though next time I'd add a bit of chili pepper and maybe a bit more salt. I knew that polenta, once cold, became something you could slice, fry, etc. But I didn't know that if you make it a bit thicker and dump it onto a board, you can slice it within a few minutes and hold it like a slice of bread. This is the core of Moldovan cuisine, and it's very convenient and cheap and filling and satisfying, especially if you mix a bit of butter in. There seem to be infinite recipes for this condiment, but I'm going to go out on a limb and say this is among the best. Garlic actually constitutes only a fraction of the ingredients, the rest being onions and a lot of butter in which the onions were fried, plus a bit of lemon juice and salt. The result is a rich, versatile, and insanely delicious spreadable sauce that I'm putting on just about everything now, and you should too. These little bundles of joy are a direct, and delicious, descendent of Turkish dolmas. Rather than grape leaves, these are preferably made with whole-leaf sauerkraut (see above discussion of Moldova's pickling), but that's hard to find and I should have started it a few weeks prior so I just blanched fresh cabbage leaves. These are typically made with some sort of ground meat, but Valeria, who'd done Peace Corps in Romania, suggested we could use ground walnuts to keep it vegetarian. What a fantastic idea, a great balance to the homogeneously soft texture of everything else after the better part of a day in the crockpot. Note on the recipe: on a hunch, I used two heads of cabbage instead of one while keeping the rest of the recipe the same, and the proportions worked out right. 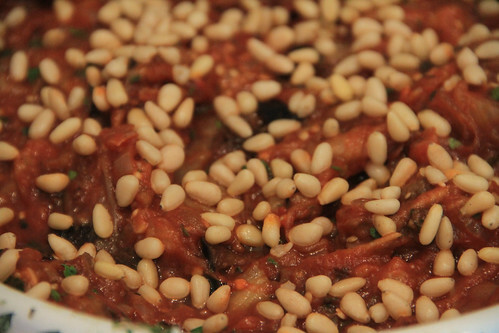 This recipe's a bit more of a production than most that I found, with bold additions like prunes and mint and pine nuts, but as a Kachka partisan I had to make their Moldovan eggplant salad. It was pretty good, with a nice variety of textures, though I wish I'd made it a bit spicier (I used sririacha and under-dosed out of an abundance of caution), and it probably could stand to be more oily. It also, frankly, felt pretty redundant with the zacusca, I'd recommend making one or the other. My god, another dish?! Well, I wasn't planning it, but when I found a porcini mushroom the size of my face at the farmers market, I figured I'd find a use for it. 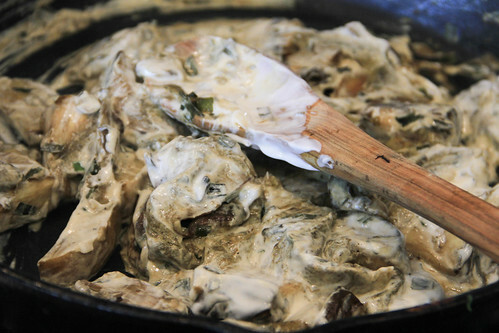 Indeed, here's a classically Eastern European preparation, smothered in sour cream. I left out the bacon because vegetarians, and I'm sure that would have tasted great, but there was plenty of flavor and texture to go around. Worth a go, even if all you have on hand is normal mushrooms. If that word looks like "placenta" to you, congrats, you're right. But the naming went the opposite way from what you may think: the flat pie came first, in Greek, and then someone thought that this component of pregnancy bore enough resemblance to the food to merit adopting the name. 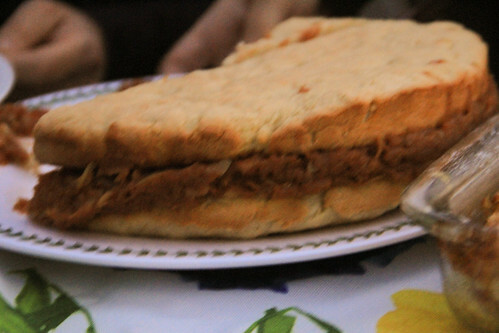 Anyway, it's made with a wide variety of sweet and savory fillings, with simple or complex dough, pan-fried or baked. I'm sure they can be very good, but this one was a disappointment. 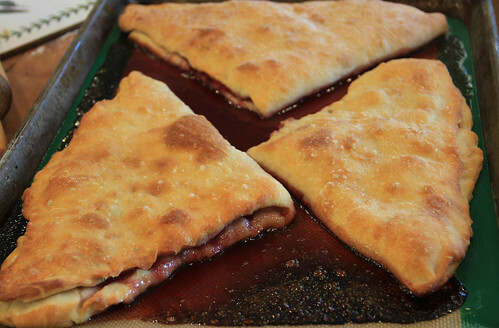 The dough turned out too thick, the filling insufficient, and the flavors unexciting. Perhaps it was my error — certainly not that of Nancy, who did a fantastic job rolling and folding! — but I'm certainly not craving this again. If you've got a need to cook this, I'd look to do it in a pan, if only to get some extra flavor from the frying. But all the same, there are dishes that, while very similar if not identical to those prepared in neighboring Gulf countries, are indelibly Qatari. Alex, a guest who'd lived in Qatar, helped me pull together a menu, and so we made an iftar-esque meal celebrating the rich flavors and spices that make the cuisine from this part of the world one of my favorites. Our crew this evening was Alex, Rachael, Nick, Allison, Melia, Marissa, Kate, Sonu, Chitra, Jessica, and Cheri. Speaking of dates, they're the classic first bite at sundown during Ramadan. They give you a hit of sugar as well as potassium, kind of like nature's Gatorade in solid form. We had two different types: big, meaty, medium-brown, wrinkly, fresh Medjools from California, and a smaller, darker, glossy, soft variety from Iran (!). They were both very good, though the Iranian ones were like I'd never tasted before so I gravitated toward those. 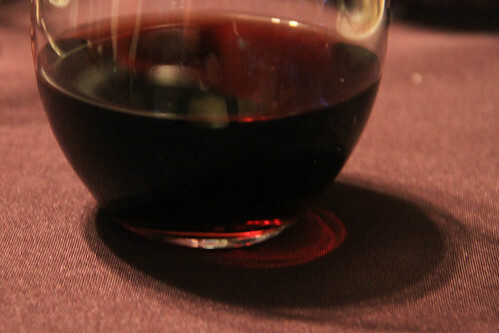 Nope, that's not wine, it's a drink made from a syrup based on the juices of blackcurrant and black carrot. 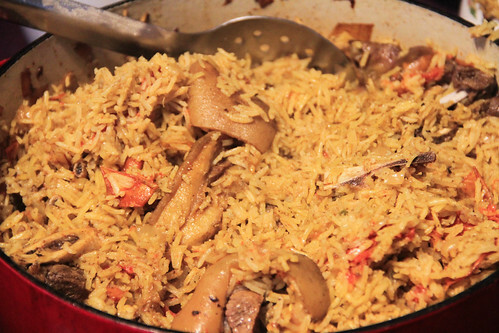 It's a recipe developed by an English company, yet through the twists and turns of colonialism and globalization, it's become an indelible part of Ramadan for millions around the Gulf. According to Alex, the Qatari government fixes the price of Vimto around Ramadan to prevent price gouging, that's how popular it is. I could see this being a flavor you grow to love when you grow up with it, but I found it fairly odd, almost in the V8 direction thanks to that carrot. I think sparkling water would have helped, but it's typically mixed with still water so that's how we did it. 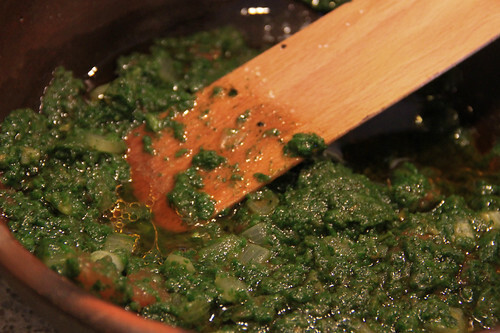 If you thought, "That name sounds like Tunisian harissa but looks nothing like it," you're on to something. 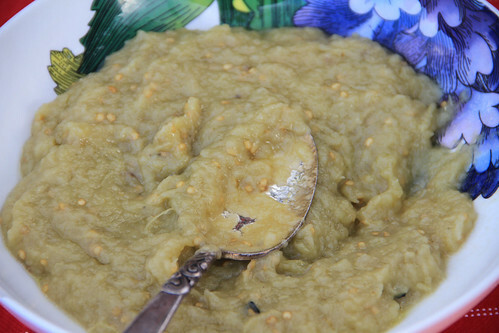 What this warm, gentle, nourishing dish and the pungent spicy paste have in common is that they're mashed — for which the root in Arabic is haras. As far as I can gather, this fantastically spiced meat-and-rice entree is the national dish. It goes by the same name as what we cooked for Kuwait but is somewhat different — there's nary a split pea to be found here, and this one is less fussy about keeping things separate until combined. I read plenty of descriptions of the meats you could use, and goat's one of them. I bought a whole goat for the Palestine nosh last year, and was excited to use last remaining bits from the chest freezer for Qatar. Alex confirmed that goat machboos is a legit thing in Qatar, so despite not finding any recipes explicitly calling for it, I took this one calling for chicken and simply cooked the meat much longer. I expected this to be really tasty. It matched, and perhaps exceeded, my high expectations. It's such an efficient dish, with the rice perfectly absorbing every last bit of broth so you get all the rich flavors of complex spices, of falling-apart goat, and of everything else in every bite. I have three portions' worth of leftovers in the freezer, and am practicing great self restraint by not defrosting and eating one right now as I write. 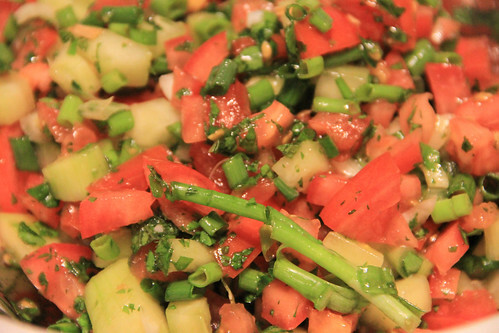 The Middle East's ubiquitous salad is always welcome. What I like about this version is the addition of mint, which makes it particularly refreshing. I don't know if that's necessarily a Qatari thing, or simply that this recipe showed up on a Qatari site, but I like it all the same. 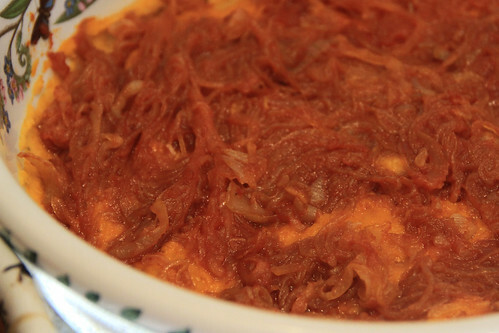 Nobody's certain why this dish is called "Ali's Mother," but we do know it originated in Egypt and that it's tasty and incredibly indulgent. Baked puff pastry forms the base, which is then covered with nuts, dried fruit, sweetened milk, and rosewater. A final layer of pastry on top, followed by whipped cream, and ten minutes under the broiler later you've got a heart attack on a plate. With the pastry pre-baked and the ingredients assembled, it was surprisingly easy to whip up at the end of the meal, and it was awesome.